The Fundamental Jewelry Design Course provides a solid foundation by training participants in drawing geometrical and other shapes, practice with water colors, sketching and shading. In addition, students will learn several styles of stone setting useful in designing, as well as learn the principles of proper design and how to utilize ready-made products (such as hooks and chains) to reduce production costs. The Intermediate Jewelry Design Course aims at improving drawing skills at a more advanced level, teaching additional water color techniques, creating inspiration for designing, developing additional designs by sketching and designing jewelry sets. The Advanced Jewelry Design Course emphasizes more complex design drawing, practice in using markers instead of water colors and improved understanding about matching colors with designs in an appropriate and efficient manner. It also covers designing for gem and jewelry industry, designing to the objectives of usage and how to calculate prices of designs. Fundamental Jewelry Design No previous gem or jewelry knowledge is required. The course is suitable for entrepreneurs, students and the general public. Intermediate Jewelry Design Successful completion of the GIT Fundamental course and/or equivalent courses in jewelry design in other schools and/or jewelry designers with a minimum of one year of experience. Advanced Jewelry Design Successful completion of the GIT Fundamental and Intermediate courses and/or equivalent courses in jewelry design in other schools and/or jewelry designers with a minimum of two years of experience. Upon successful completion of the courses and exams, students will receive the GIT Certificate of Fundamental, Intermediate, Advanced and Inspired Jewelry Design. 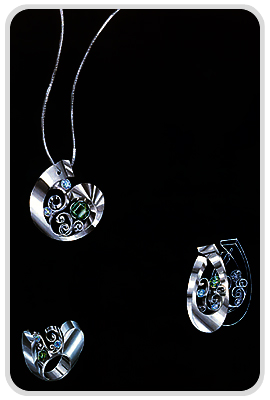 GIT offers three different courses in computer-aided jewelry design, each based around the popular JewelCAD, Rhinoceros or Matrix software packages. The courses teach how to use the individual computer program for creating designs as specifically employed in the gem and jewelry industry. It covers variety of jewelry designs and significant subjects related to jewelry making as well as the use of functions of the individual programs in creating and professional presentation of jewelry designs. No previous jewelry design knowledge is required. Only basic computer skills are required. 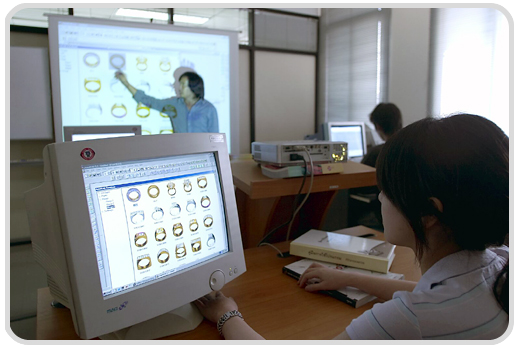 Upon successful completion of the courses and exams, students will receive the GIT Certificate of Computer-Aided Jewelry Design.